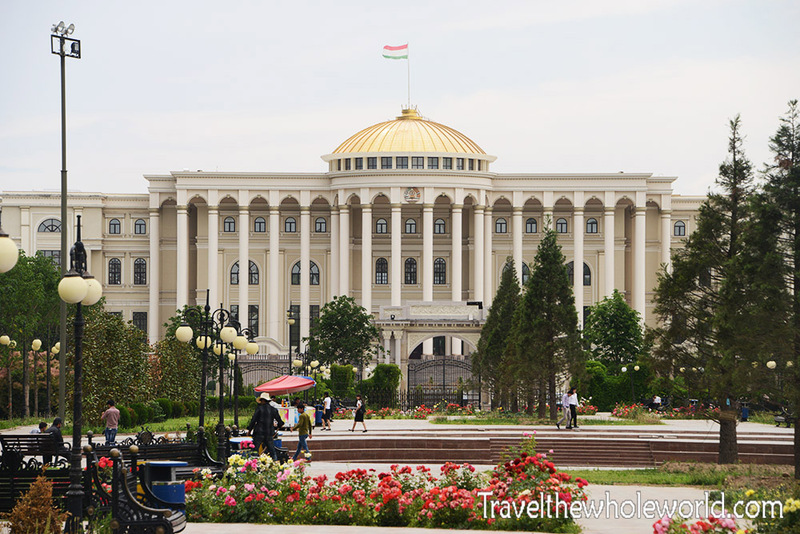 Tajikistan is ruled by president Emomali Rahmon, who has been running the country since 1992. Throughout the country and the capital, you can see several of his residences. On the way north from Dushanbe for example, I passed by one of his cottages. 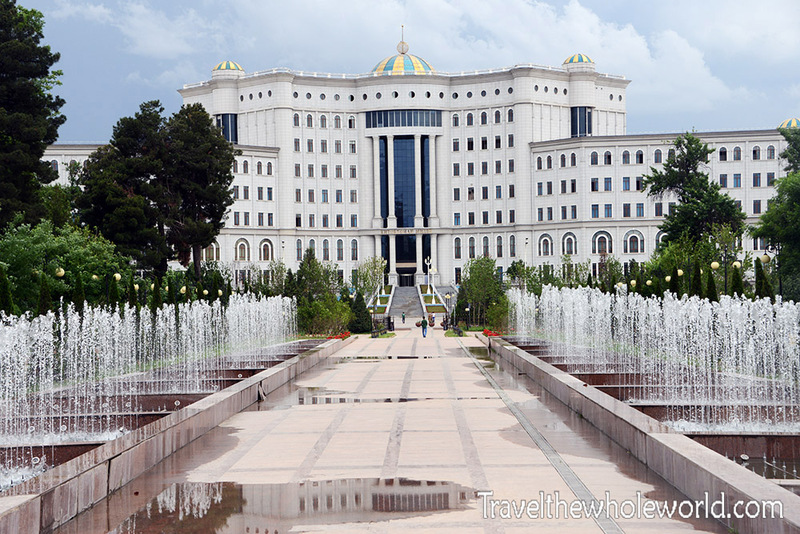 In Dushanbe you can view his main royal residence. As a native of Virginia outside of Washington DC, this seemed much larger than the White House! I tried to take a photograph from the gates but a guard there pointed for me to leave. I figured I’d not be able to photograph this place, but across the street from the palace there is a nice city park. The view from there was great and I could take all the photos I wanted. 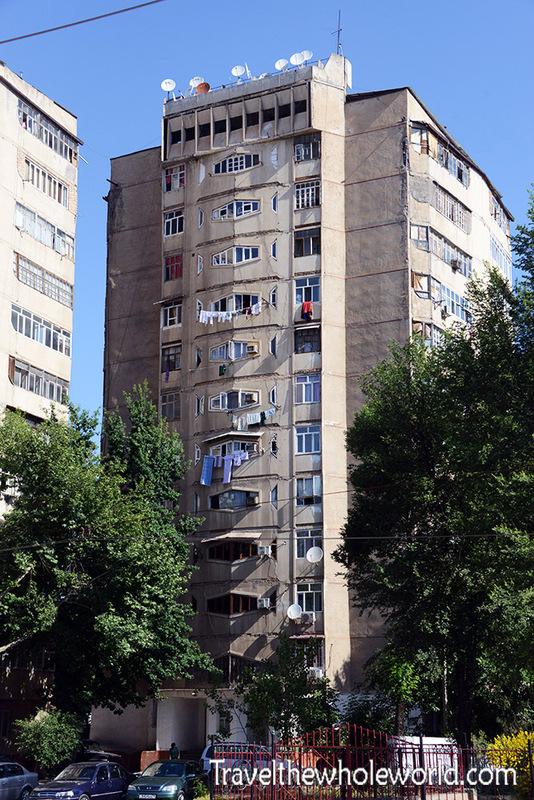 This building above is actually the former presidential palace. While you can see it’s still a very impressive building, the president got quite an upgrade when his new palace was built. 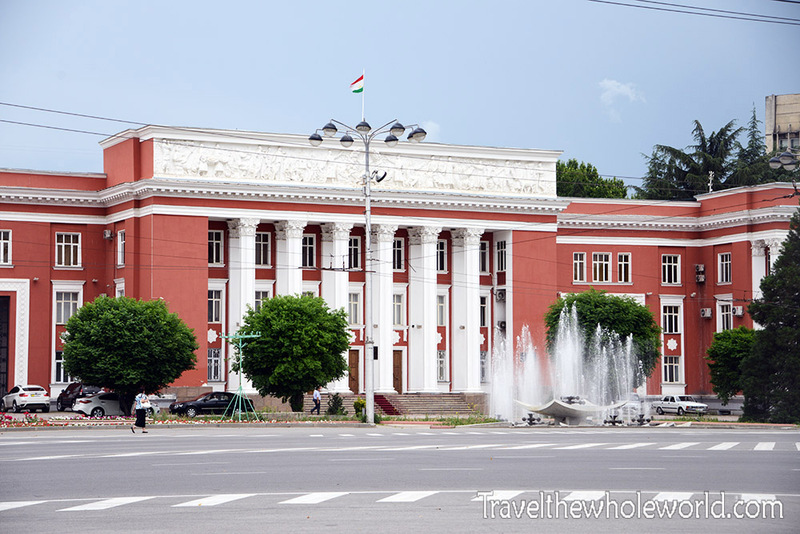 In more recent years, the Tajik government has plans now to reinvent the city, and destroy such buildings of “negative value” that even includes the former palace above! Much of the population is against this, but there is little political power they have to do anything. Other buildings include two historic theaters and the locally favorite Rokhat tea house. While the president rules from his massive palace, the seat of the government is this humble building above. 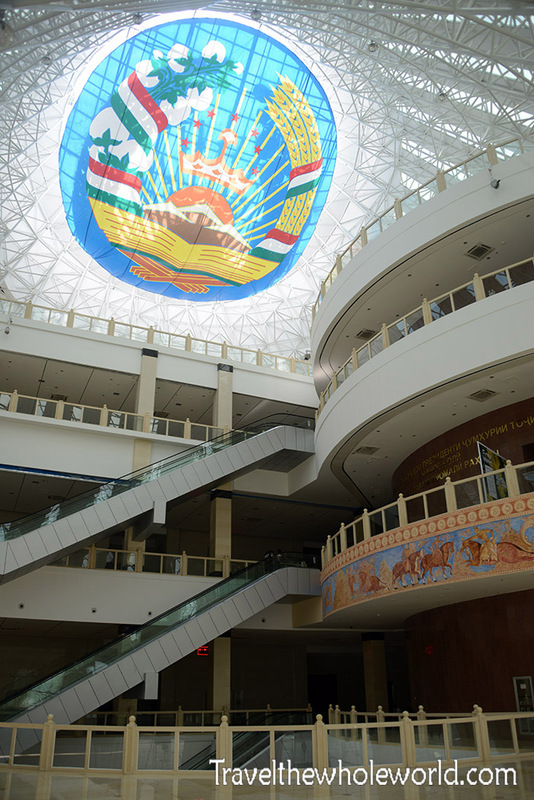 I didn’t exactly understand the story, but something with the use of the Tajik parliament building or maybe even its Soviet architecture makes it unique. 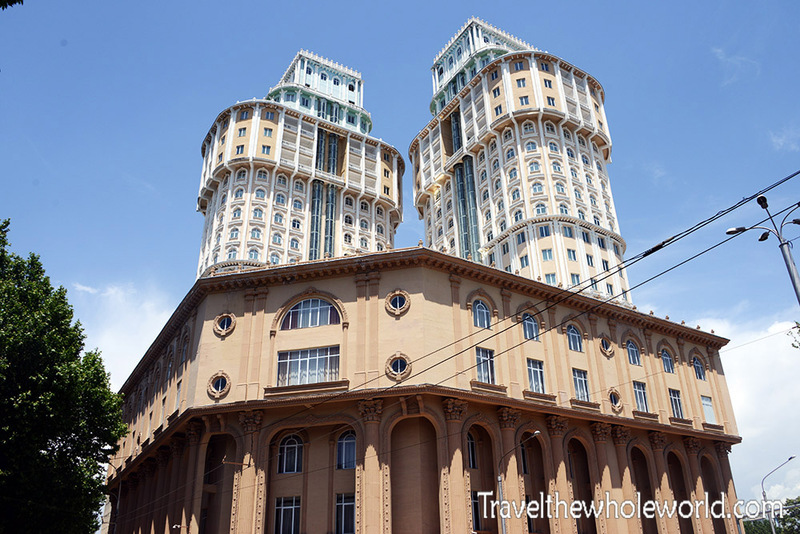 Whatever it is, the only other building like this in the world is in St. Petersburg Russia! Back to the area by the place in the heart of Dushanbe, I came across another city park with a large statue dedicated to Isma’il ibn, with a close up below. Isma’il ibn Ahmad was a leader in Central Asia around 900 AD, and brought stability and prosperity to the region. Although he mostly ruled from nearby Bukhara, Uzbekistan, he is credited for renouncing Zoroastrianism and bringing Islam to his people. He’s perhaps the most respected person in Tajikistan, and the highest mountain in the country is named after him as well as their currency. Also in this park you’ll see this massive building above. Of course I assumed it was some palace or political building, but as it turns out it’s actually a library! 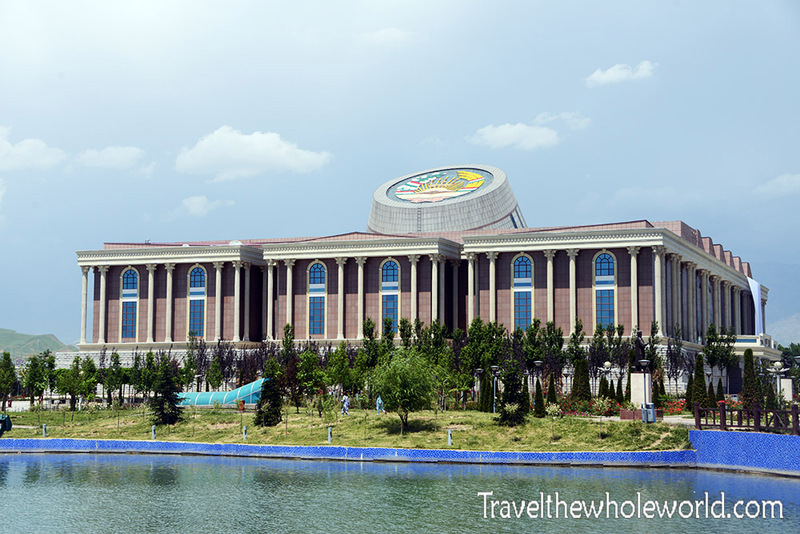 I found it hard to believe at first, but the National Library of Tajikistan opened up in 2012! One of my biggest failures was not touring the inside of the library, but it was closed on the day I tried to see it. The library supposedly has over 11 million books. 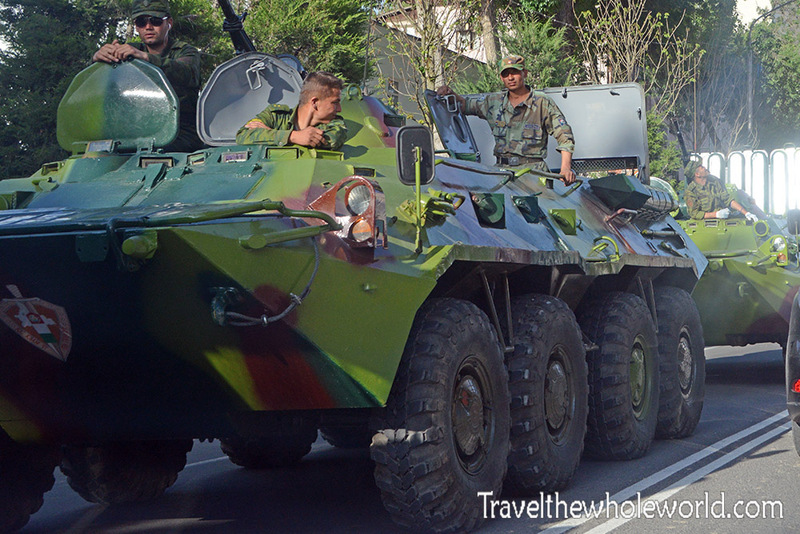 When I visited Dushanbe, it was either some type of holiday or the country was having an overreaction to the violence in the neighboring Pamirs. I saw long lines of armor driving down the street as well as troops both in desert and woodland camouflage being mobilized. I noticed that the desert camouflage uniforms had USMC printed on them, which stands for United States Marine Corps. I spent five years in the Marines, so I know how we didn’t like how the rest of the US armed forces copied our new camouflage utilities during the 1970s. Our new uniforms in the early 2000s had the USMC put on them to prevent other branches to use them. That worked in the US, but didn’t work in Tajikistan! 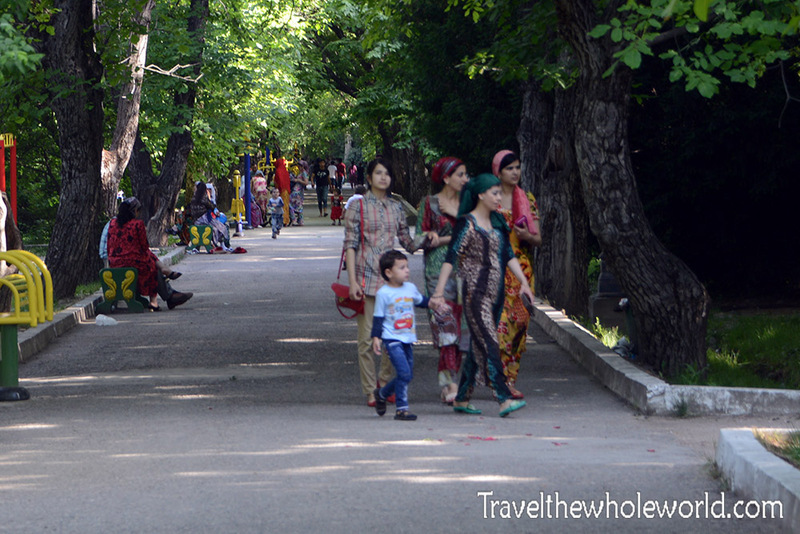 Something I quickly noticed about the people of Tajikistan is that they are pretty open. The two women above and later on the kids below both initiated a conversation with me when I was passing by. 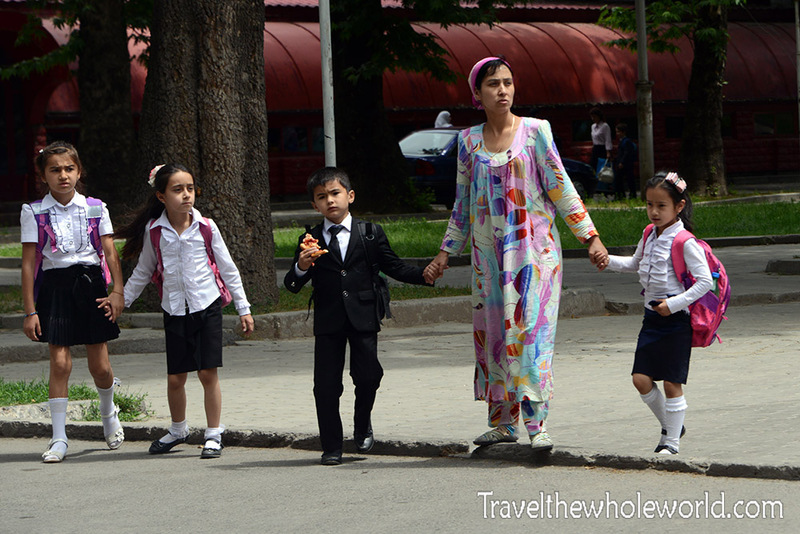 I also noticed that the majority of the women in Tajikistan were pretty stylish. The kids below were of course dressed up for school, but otherwise most men had a variety of clothing, ranging from shorts to a suit while women were almost always dressed up. Here’s some more photos of locals in the capital; the family below and another example of the stylish clothes people wear above. 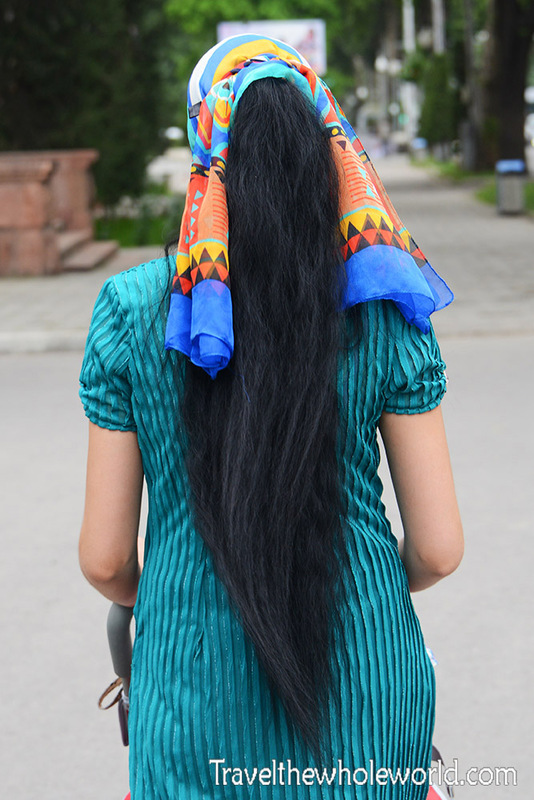 The two women with the colorful clothing that had their hair fully covered seemed to be an exception, as the majority of Tajik women didn’t seem to do this. Usually it was like the photo above, where only the very top is covered. It was pretty rare that I saw a man with a large beard and traditional Islamic clothing in Dushanbe, although I did see this a lot up in the mountains. I kind of took this photo on while driving by so it doesn’t show the entire building, but this is the Soviet Union’s former KGB headquarters for Tajikistan. Of course the Russians no longer have anything to do with the building anymore, but it serves as the same function for Tajikistan now. This is their version of the CIA/NSA headquarters so it was probably best I didn’t stand outside and attempt to get some better photos of it! This building on the left caught my attention as I was walking by. 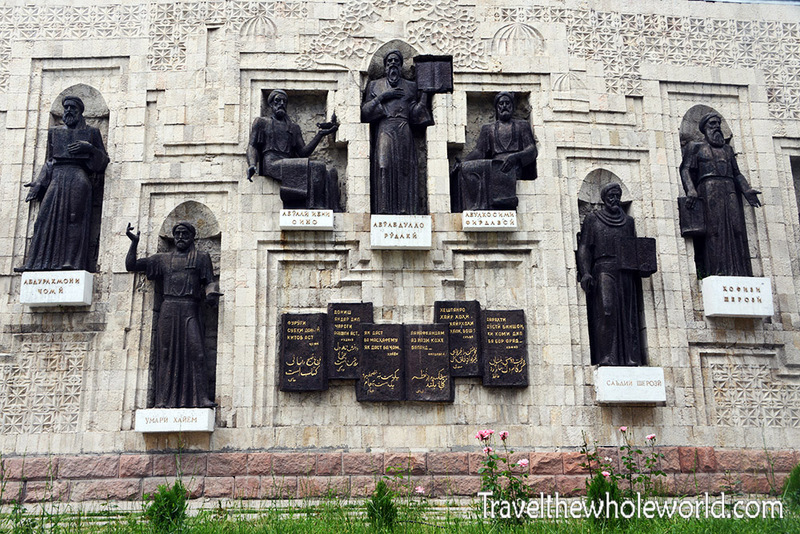 It’s a memorial to all the famous writers and poets that once lived in the former empires and countries that now make up Tajikistan and is known as the Tajik Writer’s Union Building. 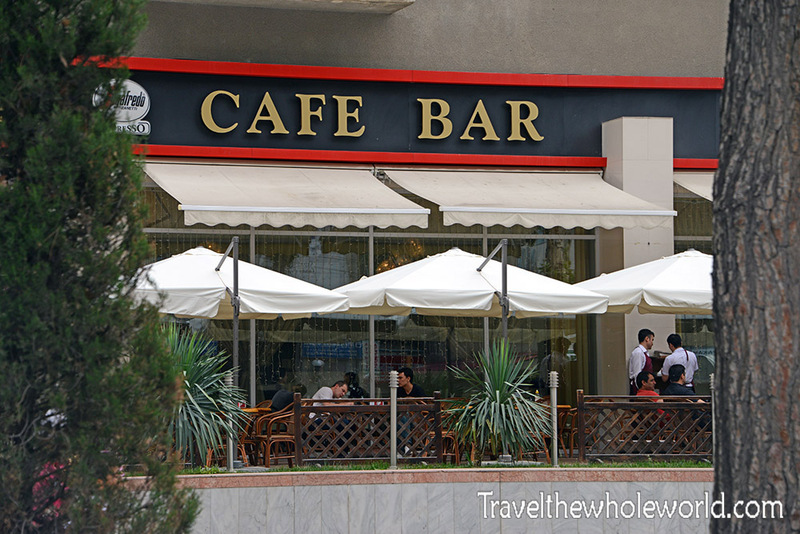 On my first day in Dushanbe I ate at this restaurant photographed above. I ended up ordering some local dishes that tasted excellent. 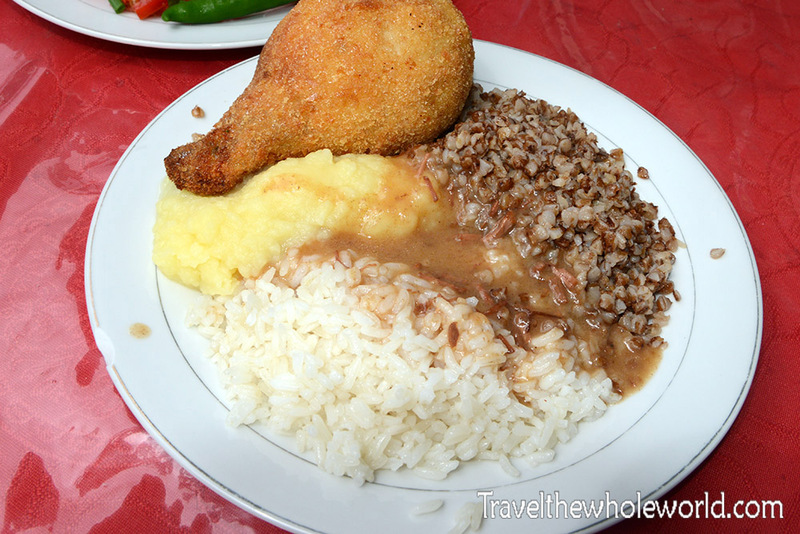 My understanding is that this dish is a mix between local and Russian cuisine. The bones in the chicken had actually been removed and filled with some type of buttery sauce. The restaurant seemed to be a popular place to eat in the capital, as there was a famous actress sitting right by me. 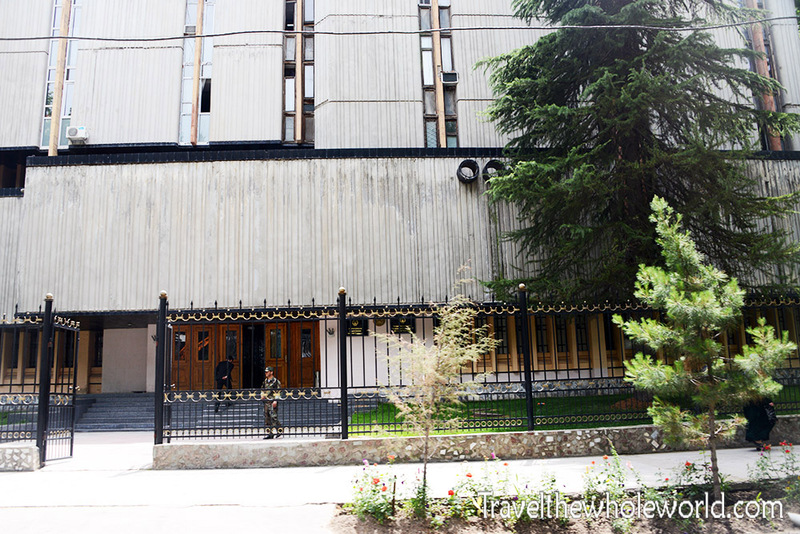 When I was in Dushanbe I stayed in the epitome of a Soviet style hotel. 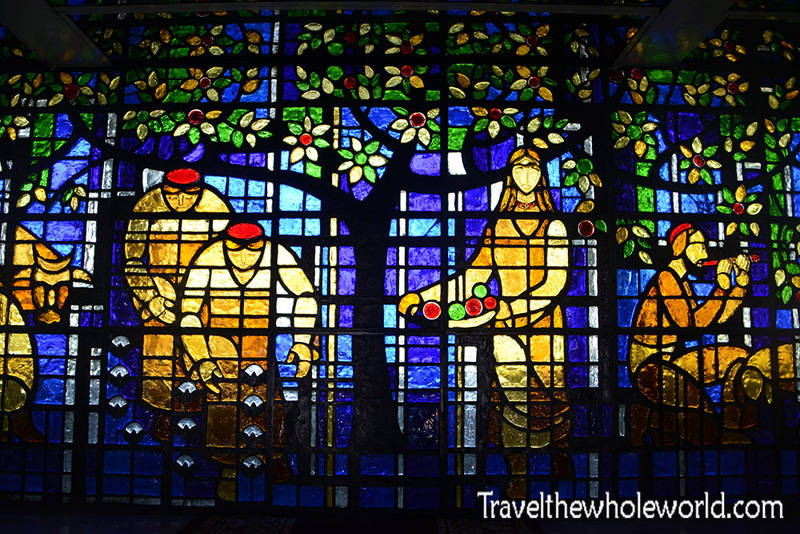 The main lobby had this large stained glass window at the back, but also large marble columns with Soviet style furniture. Each floor had a desk with an attendant sitting at it who would always ask me questions in Russian, to which I could only say “Ni Panimaiu”, or I don’t understand. The rooms themselves were pretty large, with my living room above. 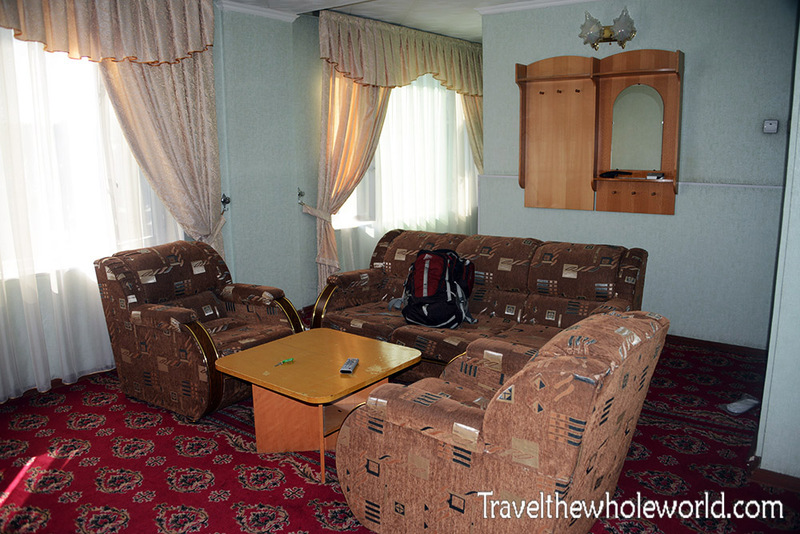 When I returned to Dushanbe later on this trip, I was given a room in a part of the hotel that hardly had any lighting, and I seriously think I may have been the only person in that entire wing. It was kind of like staying in a haunted hotel. All the hallways were extremely dark, and the only noises were the floors creaking when I walked around my room! If you’re looking for nicer accommodations or even western restaurants in the capital, there are definitely a few that exist. I didn’t make it to this Cafe Bar but I understand it’s a popular place in the city, especially among expats. Most of the city is made up of more traditional buildings and restaurants, such as where I ate at my first day, or the these apartments on the right that are close to the city center. 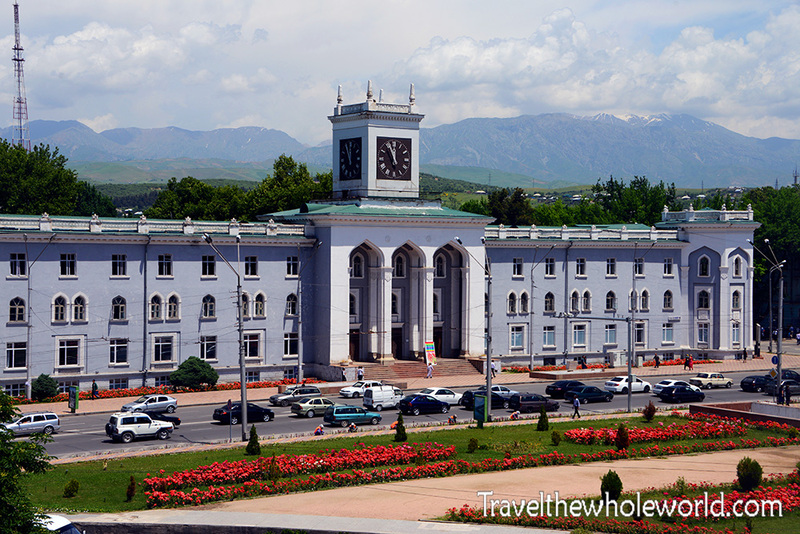 When I arrived to Dushanbe the first place I went to was my hotel, and from there was where I took my first photo of the country seen above. I didn’t know what this was at the time, but it was once the country’s national museum. I tried to find out what the building’s purpose is now but never was able to. 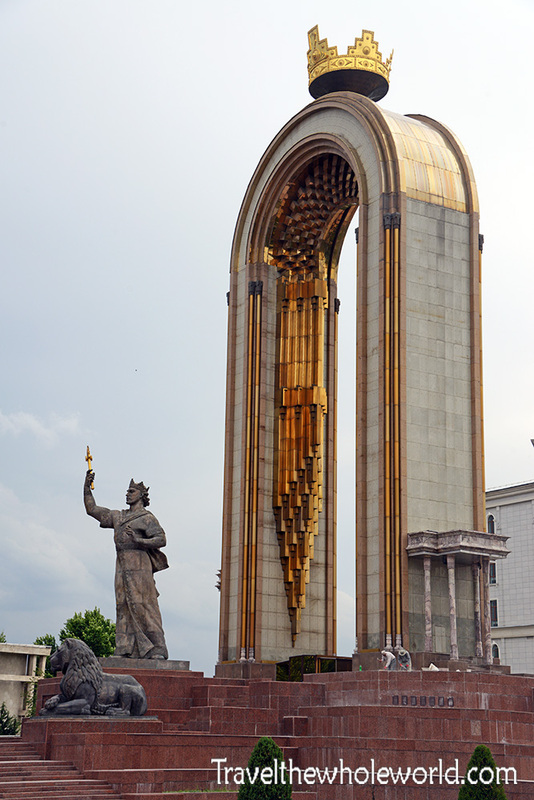 Dushanbe was in much better condition than I expected it to be. Honestly I thought the capital would be pretty beat up, but there’s definitely significant building and remodeling being done. As I mentioned earlier, the Tajik government was on a mission to rebuild parts of the city, even if it meant demolishing historic areas and buildings. Hopefully there wasn’t anything important here before, but when I visited Dushanbe these two large towers had just been completed. The bran new buildings are actually luxury apartments located in the middle of the city. Another thing they got right was their new national museum. You can tell it’s absolutely enormous and way larger than their original museum. It was also built right across from the new presidential palace. I was surprised that such a small country had such a large museum, and it was also nearly bran new when I visited. Above is a photo from the outside, with the main lobby below. In every country that I’ve ever been to, when you get a visa it’s good for a duration of time after you arrive such as 30 or 90 days for example. With Tajikistan for whatever reason they gave me the visa based exactly on the dates I had submitted for my itinerary. 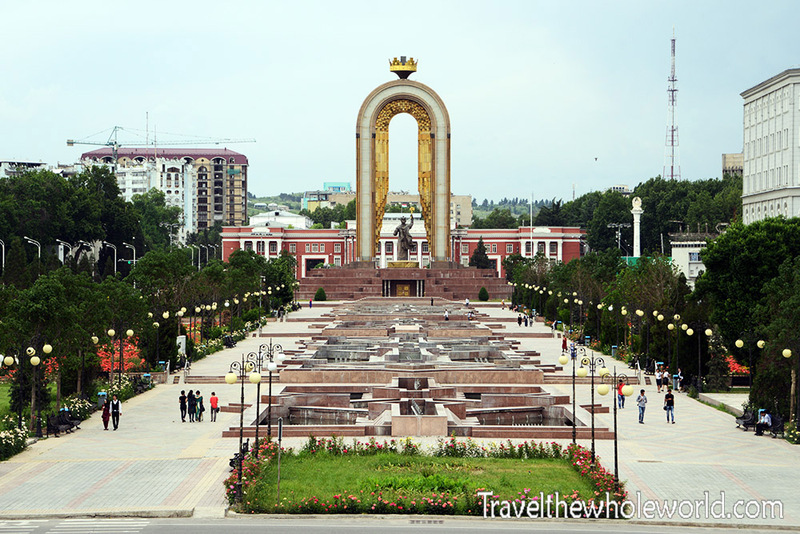 When my trip actually started I had to go to Tajikistan later than planned, and since my visa dates were specific this meant less time in the country than I wanted. This came down to me not having enough time to visit the Pamir mountains; sadness! The Pamirs are probably the highlights of Tajikistan. 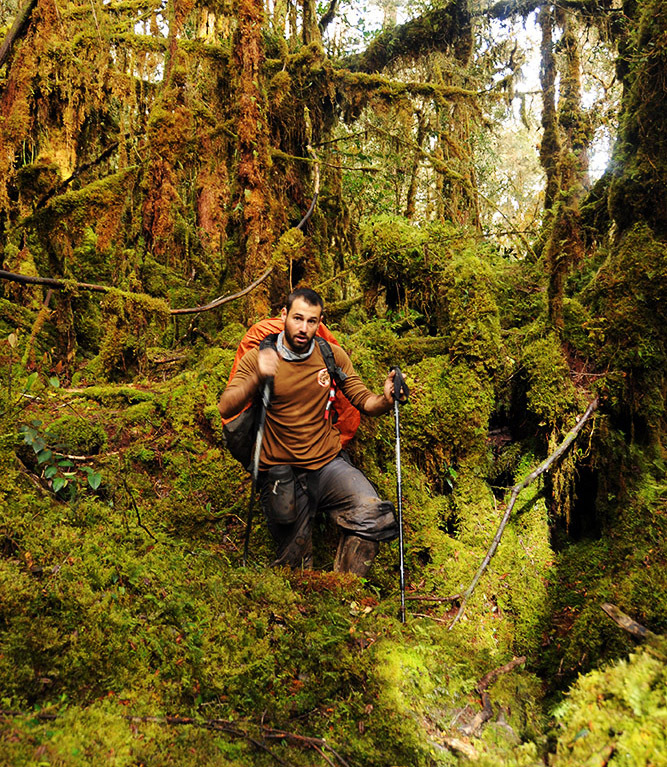 The mountains here are among the highest in the world with some reaching nearly 25,000 feet (7,500 meters). 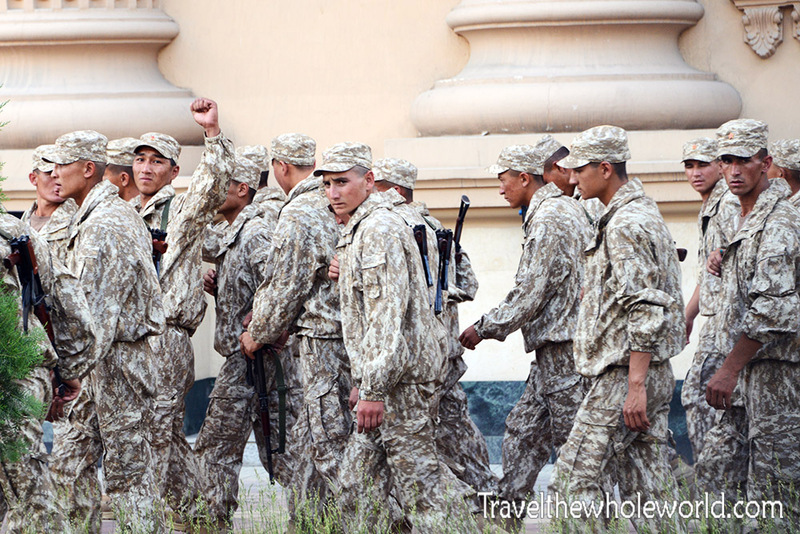 As it turned out, some violence with the locals in the Pamirs flared up and they were put off limits to foreigners so I would not have been able to visit anyways. 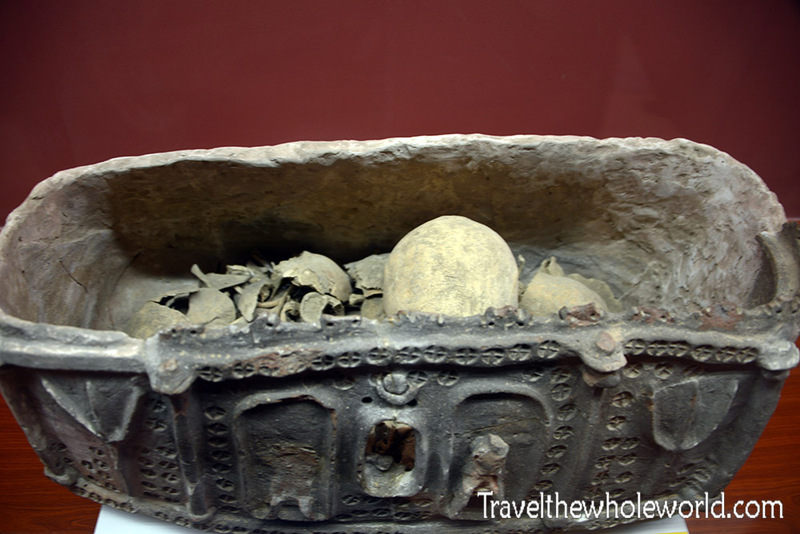 The best I could do was learn about the Pamirs in the national museum. 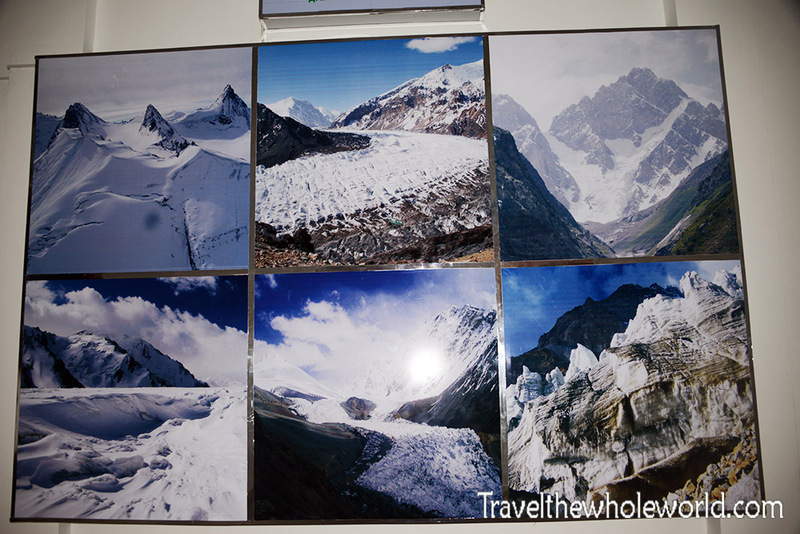 Above are some photos of wildlife that live in the Pamirs while below is a collage of photos taken from the mountains. 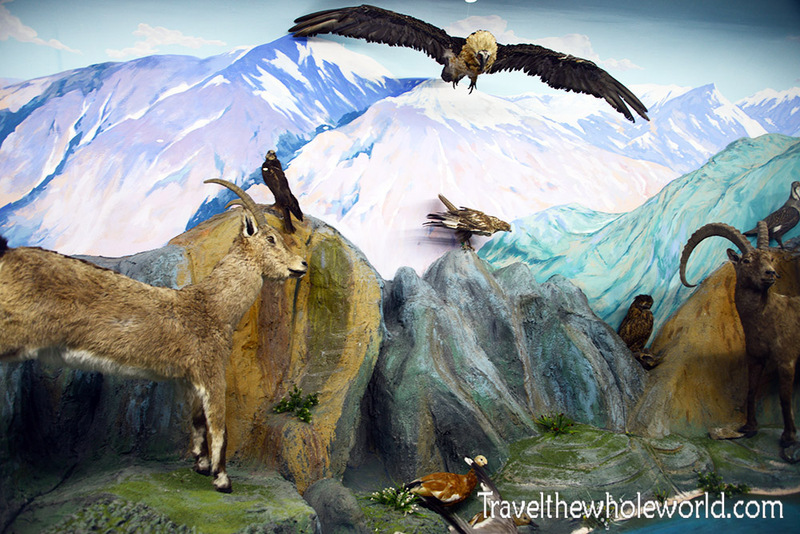 The national museum had a large area dedicated to the Pamir mountains. Later I came across another area about the same size if not larger dedicated to the Zoroastrian religion. 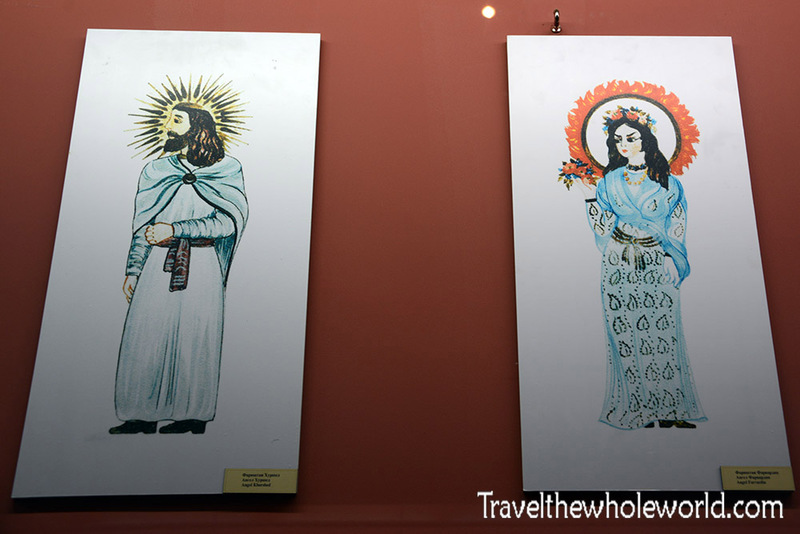 I had just been in Iran the year before, and was under the impression that while the Zoroastrian religion had spread well beyond Iran’s borders there wasn’t much history left in other countries. 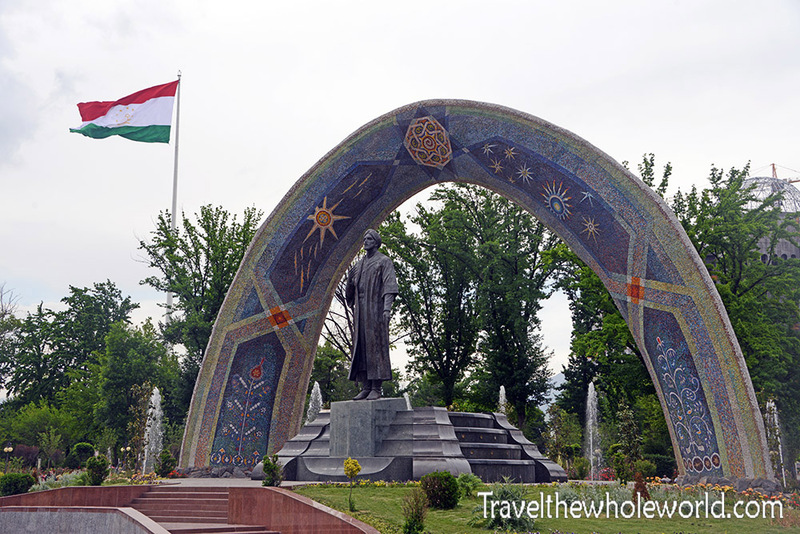 As it turns out, not only was Tajikistan was once a Zoroastrian nation but it was one of the first! 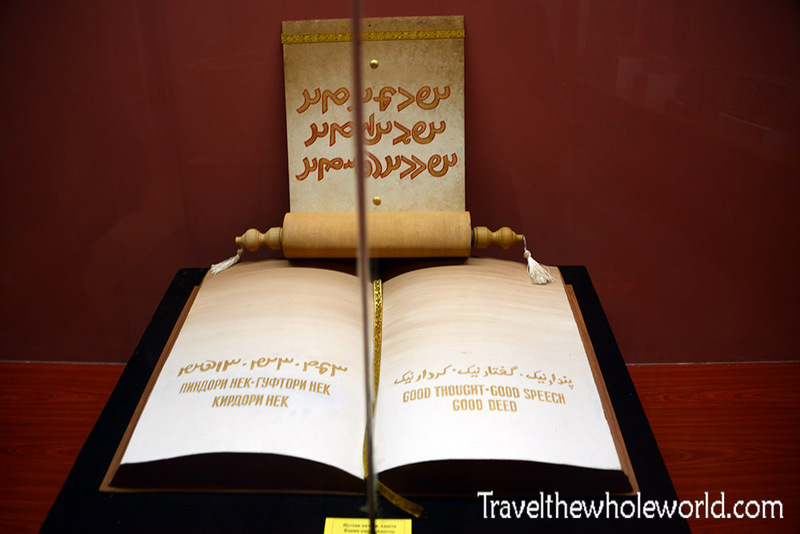 Above is the bible of the Zoroastrian religion. A large number of the same exact paintings and replicas of artifacts that I saw in Iran were also on display here in Dushanbe. Somethings that were new to me in addition to the Zoroastrian Bible, were the acid bath above and some photos of Zoroastrian angels below. In Yadz, Iran I had learned that Zoroastrians had left their dead to be eaten by vultures as a means of returning their lost ones back to the earth. They then put the remaining bones in an acid bath as seen above. In Iran I saw the actual temples were the bodies were put up for vultures, but not any of the acid baths themselves. 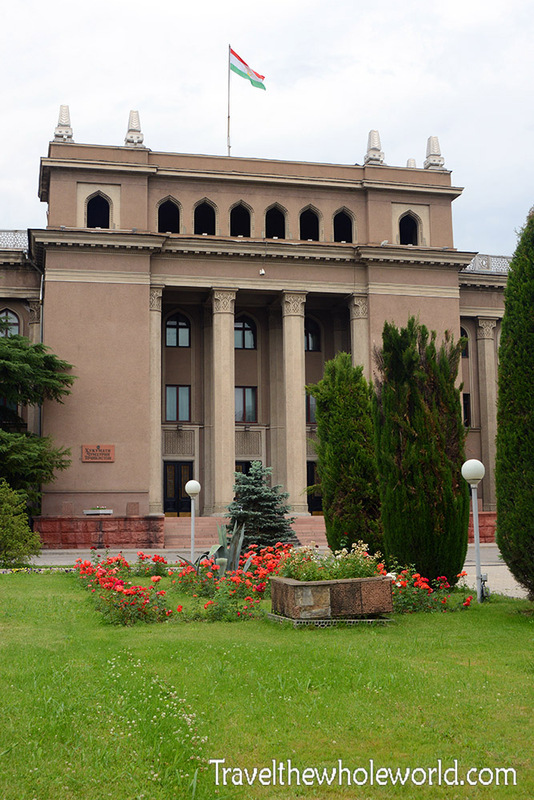 There’s a lot to be seen in the national museum, but since I can’t post everything I’m going to move on to Dushanbe’s antique museum. 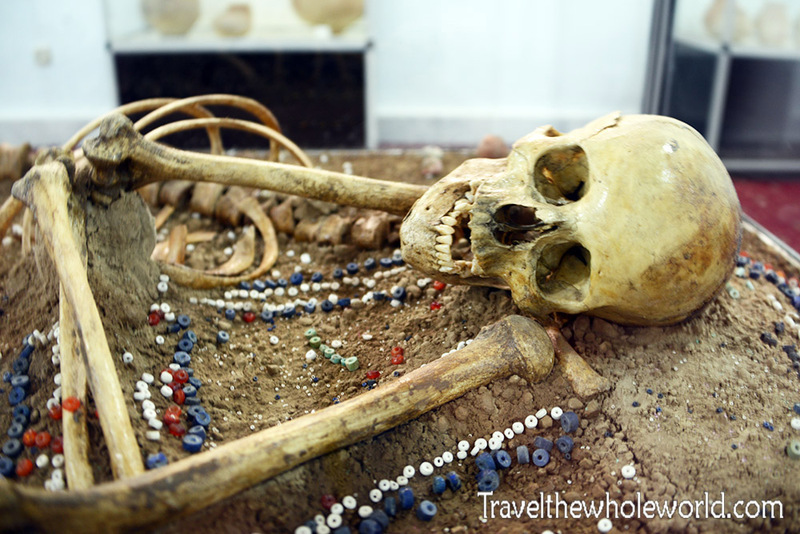 It’s much smaller than the national museum but is definitely worth visiting nevertheless. The antinque museum has several interesting artifacts, but one of the most important are the remains on this girl above. Described as the “Princess of Sarazm”, she was unearthed from the ancient city of Panjakent where she was found buried with elegant jewelry. 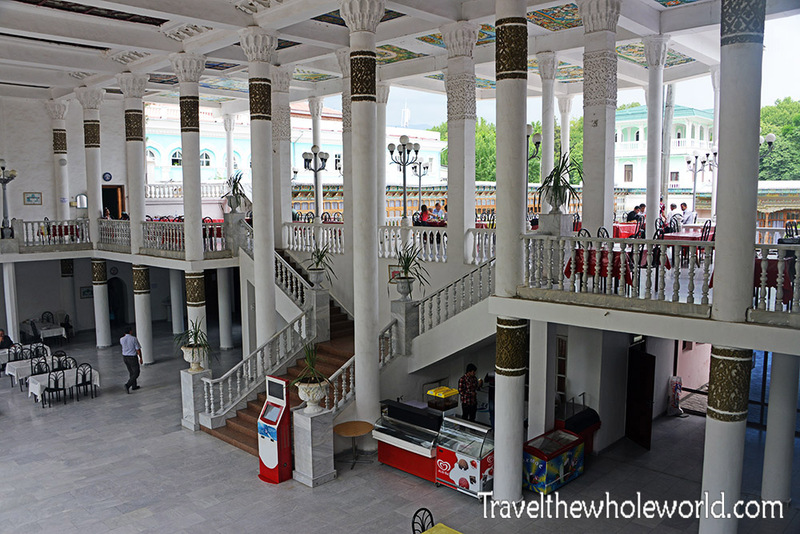 Panjakent is one of Tajikistan’s most historic city’s, and the Princess of Sarazm is equivalent to Peru’s Juanita mummy or Europe’s preserved Iceman. 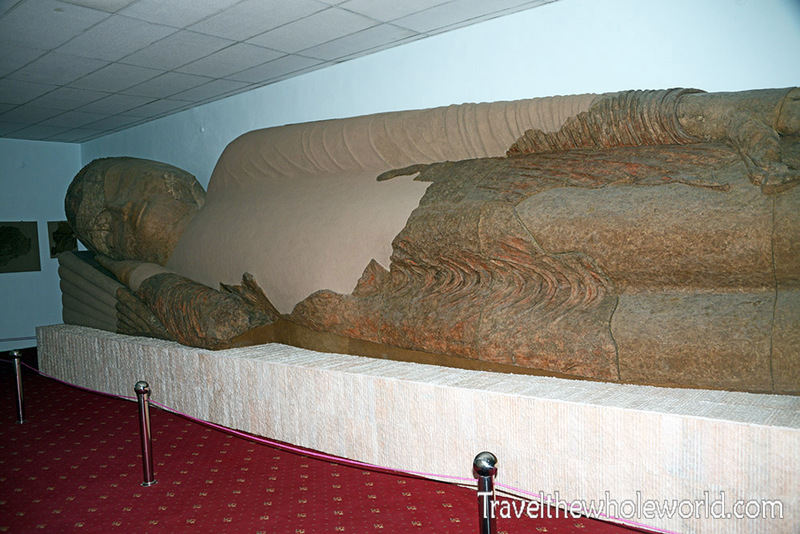 Also in the museum is this thirteen foot reclining Buddha statue that was unearthed in southern Tajikistan in the 1960s! The statue came from the same people and time period as the famous Bamiyan Buddha statues in Afghanistan that were destroyed by the Taliban. As Tajikistan was also once a Buddhist nation, there are still artifacts and temples left over from over a thousand years ago. 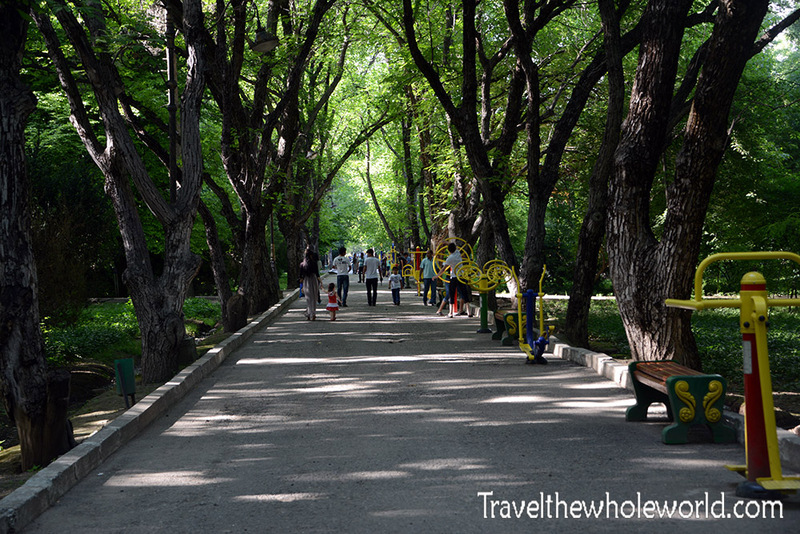 One of my favorite areas in Dushanbe was this enormous park and garden. I’m not sure how big it is exactly, but I walked the entire length of this main street and it must be over a mile long. The yellow objects are silly contraptions that line the entire way. They’re mostly things like work out devices, swings, etc. There were lots of people here, so I’d image it’s one of the most common places for families to go to. I also saw two weddings taking place. 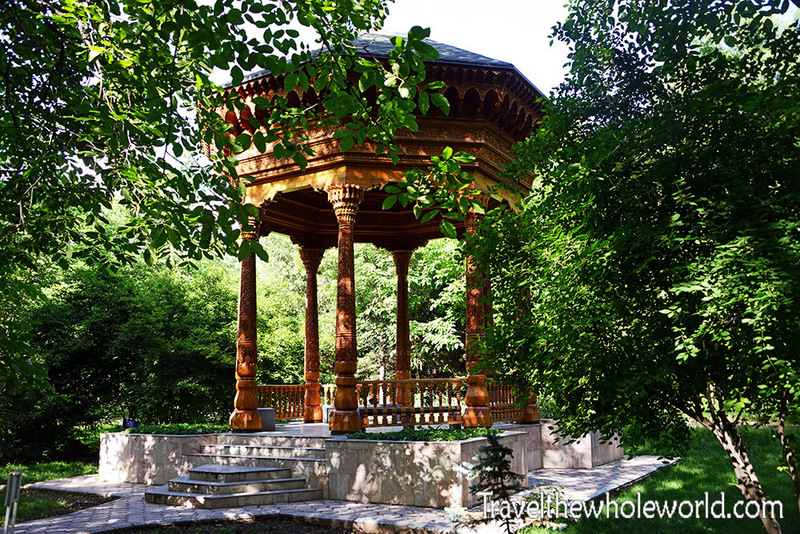 There were several beautifully carved gazebos like the one above. 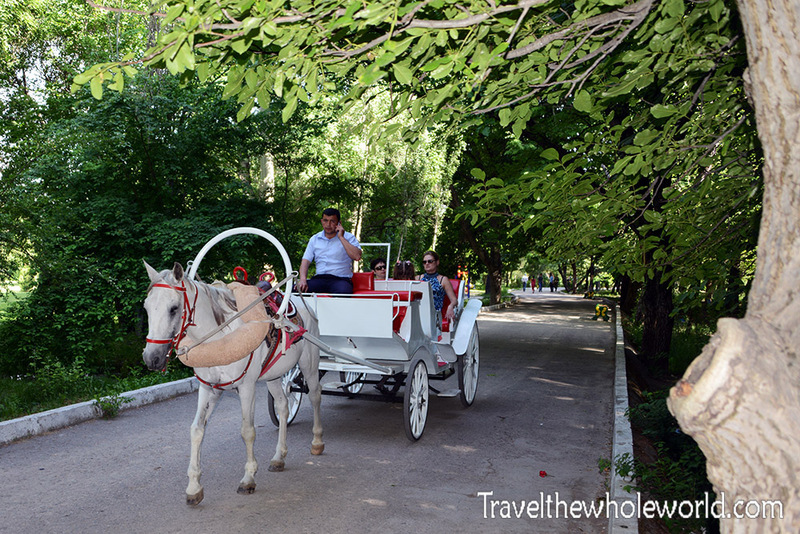 Below is a photo of some locals getting a ride by a horse and carriage, with the driver ruining my photo by talking on his cell phone. 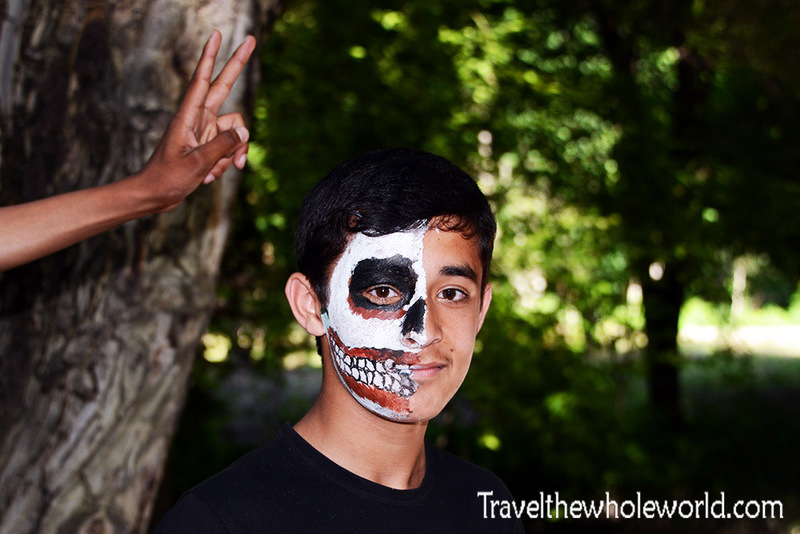 These last two photos from the Dushanbe Gardens show a random skull kid who I caught strolling around alone. I didn’t see anyone else with face paint so I’m not sure if he was part of a birthday party or something. 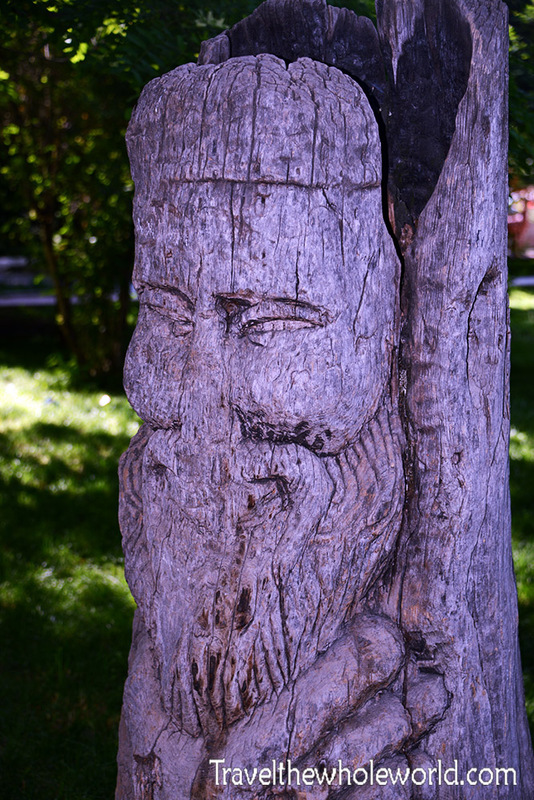 The carving below was near a giant tree called the Happy Tree. Like the museum, I can’t post all my photos from the gardens but I probably enjoyed visiting here more than any other part of Dushanbe!